Most commercial fishers will readily agree that burbot is a little-known delicacy. Its firm, white flesh resembles that of cod and haddock, which should be no surprise since it is a member of the freshwater cod family. It is often served as “Poor Man’s Lobster” by steaming chunks of meat and dipping them in drawn butter. Burbot is also excellent when fried. The vitamin D potency of burbot liver oil is as high as that obtained from cod liver. Almost a hundred years ago it was discovered that foxes raised in captivity and fed burbot had better quality fur. The liver was found to be very high in vitamin D and A even when compared to good grades of cod liver oil. A burbot’s liver is about 10% of its body weight and six times bigger than that of other freshwater fish of the same size. Burbot is classified as a rough fish by the state of Wisconsin, meaning that it is an unregulated fishery. 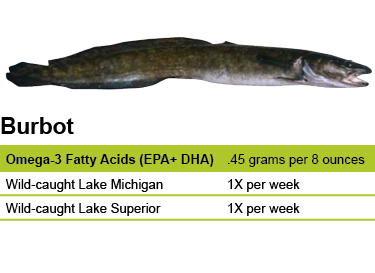 The burbot has never been of commercial importance in the state because of its low market demand. Even in the very early years of commercial fishing on the Great Lakes, most burbot were discarded from whitefish and lake trout nets, except for a few sent to local markets. This is still the case today, except for one enterprising commercial fisherman on Door County’s Washington Island. Ken Koyen fishes for burbot and serves them up at his restaurant KK Fiske and The Granary. State health agencies have found that it is safe to eat Lake Michigan and Lake Superior burbot once a week. Also known as eelpout, lingcod and lawyer, the burbot looks like a cross between an eel and a cod—it has a long body with smooth skin and a single barbel, or whisker, on its chin. The burbot is a member of the freshwater cod family, and it shares many characteristics with its saltwater cousin, including mid-winter spawning. Burbot have an odd habit of wrapping their slimy tails around the hand or arm of unsuspecting anglers when caught. Perhaps because of this behavior, and their slimy eel-like appearance, the burbot has never been a popular sport or commercial species in the Great Lakes despite its excellent taste. The burbot is one of two predatory fish species native to the Great Lakes. The other is the lake trout. Both species were decimated by the invasive sea lamprey, but the burbot recovered on its own while the lake trout has required ongoing restoration efforts, especially in Lake Michigan. Some biologists have suggested that burbot may be hindering these restoration efforts because they prefer to eat young lake trout, but more research needs to be done to understand fully the role of burbot in the current Great Lakes ecosystem that now includes many nonnative species. Leech Lake, Minnesota, is the site of an annual burbot ice fishing contest known as the International Eelpout Festival. This unusual, and tasty, fish has become a focal point for winter festivities in the nearby town of Walker. Ice fishing with minnows at night is the top method.